Every time that eMule is started local ports that are used to connect to a server are changed by random. The port range you can set depends on the mod you are using. Some mods allows you to modify it and set a custom port tange between 1 and 65535, others allows you to define a number of ports and these will be selected in a random order, and others mix port ranges and port numbers. Note that this setting can cause problems if you connect to the internet through a router that may result in LowID connections to the ed2k server or, worst case, no connection at all. The reason is that eMule requires specific ports to be forwarded to your LAN's eMule computer via NAT in your router's configuration. 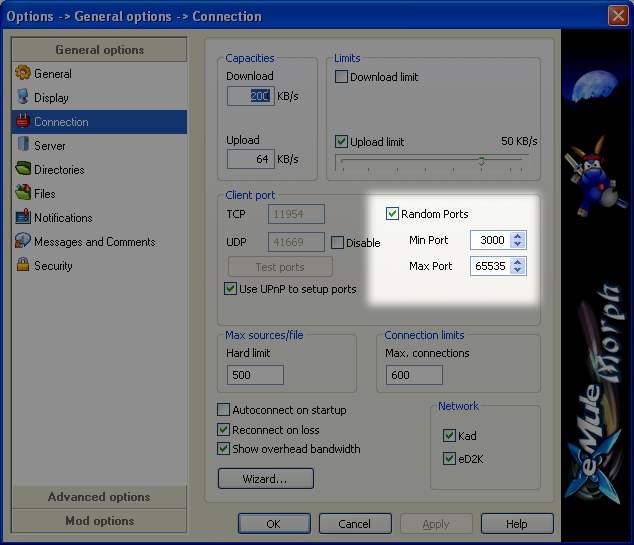 If these ports change dynamicly, your router will not know which of the incoming packets have to be sent to eMule's specific LAN-IP. To solve this, use UPnP - Universal Plug and Play. On the first install official emule client since 0.47b randomizes the emule ports once. This is because providers sometimes block port 4662, the default eMule port. This page was last modified on 18 November 2010, at 14:48. This page has been accessed 5,307 times.